The WPFMHG Mobile Safety Training Unit is a custom made and designed rolling class room. 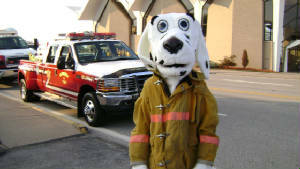 The Unit has amenities to teach fire safety, weather preparedness, home hazard safety, gain awareness to building codes and even teaches children how to dial 9-1-1. Sprinkler Demonstration / Building Code and Operations & Effectiveness Teachings. Weather preparedness (simulated tornado and hurricane storms) importance of having a weather radio, understanding of weather watches / warnings, what to do during a storm. 9-1-1 Phone Training – practice making 9-1-1 calls. Commercial Building Safety – Fire Pull Stations, Exit Signs, backup power. Home Hazard Safety – review of potential hazards such as blind cords, lock boxes for fire arms, and other life safety equipment such as seat belts, life vests, bike helmets, and knee / elbow pads. 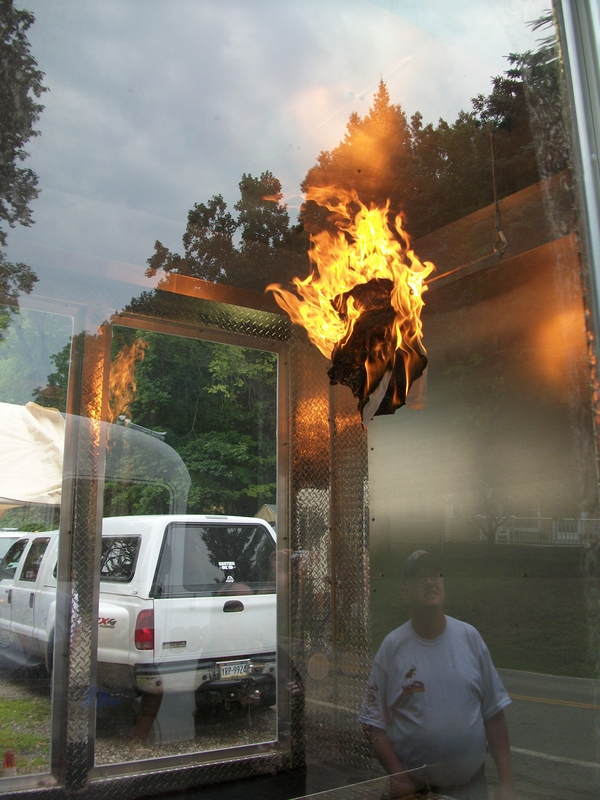 What sets our unit apart from the rest is the specially designed live burn areas in the front of the trailer. The burn room allows for live demonstrations of sprinkler operations. Live burns take place and the heat is directed toward a real sprinkler head. The way it works is that a fire is lit using the specially designed equipment. After the fire is working, the smoke detector will sound, and as the heat reached 135 degrees the sprinkler pops – the fire is put out and the water drains to the curb side of the unit to show how little water is used compared to a typical fire hose. People watch the entire scenario from the outside as it is explained using the external PA system. Statistics show that people are 80% likely to survive a house fire compared to residences without sprinklers. Furthermore the PA Uniform Construction Code now requires sprinklers in all construction and new homes. The W.P.F.M.H.G. Mobile Safety Training Center is towed by Utility 386 to various locations throughout Western Pennsylvania. To reserve the Unit for your event, please call CMDR. Martin Kauer at 412-279-1641. 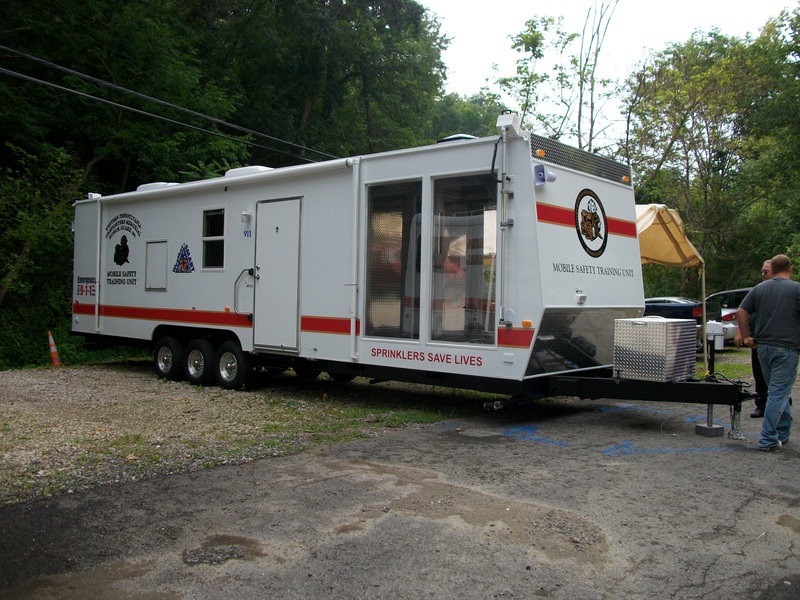 The WPFMHG Mobile Safety Training Unit is specially designed to also be used as a mobile command post in time of disaster or emergency. Located in the rear bedroom is a command desk that has hookups for radio equipment, AC and DC power, and phone jacks. The unit also has a working kitchen with a sink, gray tank, microwave, and refrigerator. Other special equipment for the emergency side of this unit is exterior scene lights, dual awnings, exterior PA system, camera equipment and audio visual equipment. The unit is also self-contained with a large Honda generator and 2 heavy-duty HVAC units. The trailer is openly available to your department or municipality should you need it. 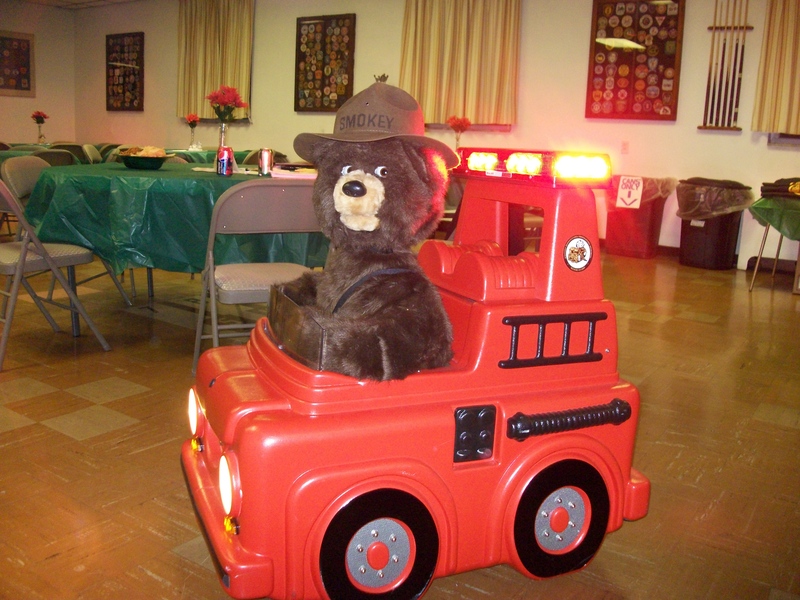 The WPFMHG has a robotic “Smokey the Bear” in a red pumper robot that is great to interact and teach fire safety to children. The robot moves about, talks, squirts water, has flashing LED lights, siren, plays specially pre-recorded safety music and is general enough to fit into your fire prevention lessons.